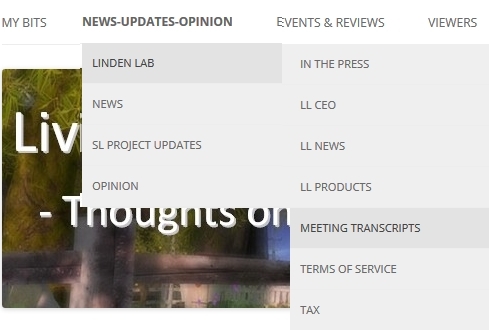 As regular readers may have noticed, I’ve produced a number of transcripts for meetings related to LL and which involve the Lab’s CEO or staff. To make finding these transcripts easier, I’ve added a new tag to the blog, which will appear appended to the end of such posts. Clicking it should list all available transcripts so tagged. Note the transcripts related to things like specific viewer meetings – such as Firestorm meetings – will remain under the relevant section of the Viewers menu (so Viewers > V3 Style > Firestorm > Firestorm Meetings for … well, Firestorm meetings!). Hope this makes finding information in the blog a little easier.